We know that healthy living means more than just healthy ingredients. Duzu Dates believes in healthy relationships nurtured by mindful decisions. Our community approach to production and growth is one of the key reasons why Duzu Dates has gained such a welcoming following since inception. We love to share our values and achievements with our closest supporters, and hope this community-centred attitude translates through each box of our dates. Duzu Dates chose the experienced hands of chocolatier, Bernard Callebaut, of Master Chocolat (Bernard & Sons) to help with the production of our chocolate-dipped treats. 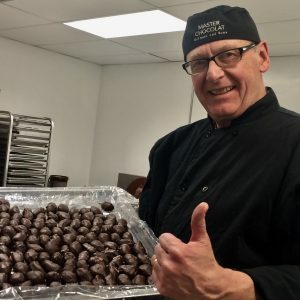 His family’s decades of experience as renowned chocolatiers make Bernard the best choice to enrobe the dates in chocolate. Dipped in the finest milk and dark chocolate available, we promise that each box of Duzu’s chocolate-dipped dates meet the highest uniform standards. Like all of our own ingredients, Bernard uses only highest quality chocolate, organic and Fair Trade wherever possible. Fair Trade practices protect the cocoa bean farmers and producers in developing countries, ensuring fair wages and trading conditions. We have several supporting roles in this creation! Close friends, the odd neighbour, and even strangers we meet have offered help – even if just to taste-test! We have a small army of volunteers who are happy to fold boxes, help package, put the bellybands on, or just bring the owner a coffee after a long production day! We appreciate each person’s contribution, and so many have been tirelessly generous in their time and energy to helping build this small, but growing entity. Duzu’s community includes the carefully selected date producer and supplier, AZIZ FARMS in Thermal, California (Just outside of La Quinta. We also order from OASIS DATE GARDENS and have had the opportunity to visit both facilities and have even met many of the farmers. This region is renowned for producing some of the best dates in the world, so an excellent choice as the dates are, after all, the star of our show. Carefully selected varietals include Organic Medjool and Barhi dates. The Bard Valley region is where these dates are grown, which runs from Palm Springs to Arizona. From the beginning, a balance of patience and inspiration drove the company and its product forward. Through several trials and lots of testing, the final results are wonderfully delicious. Duzu Dates presents only the most delightful treats made from quality ingredients with healthy living in mind.